Don’t focus all of your energy on only hunting for the best coats and boots on the market because of the dropping temperature. Yes, they’re important items when it comes to battling the cold, but winter 2018 dress trends are exceptionally good this year and deserve a little love too. There’s nothing worse than shedding that rad but expensive coat you just bought upon arrival to a holiday party only to reveal a tired or uninspired look underneath—spend a little time investing in a new frock or two and that won’t happen to you. Although the fall/ winter 2018 runways served up a lineup of dress trends longer than Santa’s naughty list, there are four that really stood out and have already proven to be hits on the sidewalk this season. A few are definitely more appropriate for after dark and some can be worn 24/7. Check them out below, pick your favorites, and shop a few options for each. Your cold weather style game will thank you. Animal print everything—from bags and shoes to dresses and coats—saturated the runways like never before. Python, leopard, cheetah, and even zebra was everywhere, rendering it one of the wildest Fashion Month’s yet. Take a cue from Ashley Williams, Balenciaga, Tom Ford, and more and snag an untamed dress of your own. The resurrection of the ’80s minidress isn’t going anywhere anytime soon. The throwback style has been repeatedly championed for the past handful of seasons, with Saint Laurent and Tom Ford being two of its most enthusiastic supporters for winter. Think exaggerated shoulder pads; bright, blocky colors; and a healthy dose of shimmer. Ruching has never looked cooler than it did on the fall/ winter runways of Kenzo, Dolce & Gabbana, Balenciaga, Saint Laurent and more. Used to add a linear detail across the bodice of a dress or simply to cause the garment to hug the body in certain places, ruching is experiencing a veritable resurgence. I personally love the detail on velvet and silk dresses—here are a few party-ready ones to shop. Metallic in foiled, glittery, or woven form is in, meaning the perfect New Year’s Eve dress will be easier to find than ever. 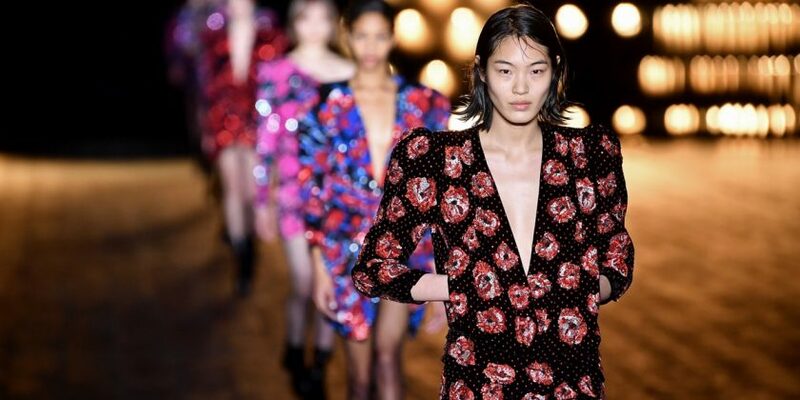 Balmain, Cushnie, Alberta Ferretti, and a slew of other designers sent their takes on reflective frocks down the runway, subsequently serving up some shining sartorial inspiration. It’s the perfect balance of party-ready dresses and those that can be worn everyday. What are you waiting for? Pick a few of your favorites and indulge. If you don’t want to take the plunge right away, at least keep the trends themselves in mind. Black Friday is coming up so chances are you’ll be able to shop one or two of them for cheap. Previous Post:Wow, Who Knew Vegans Aren't Supposed To Eat Honey?